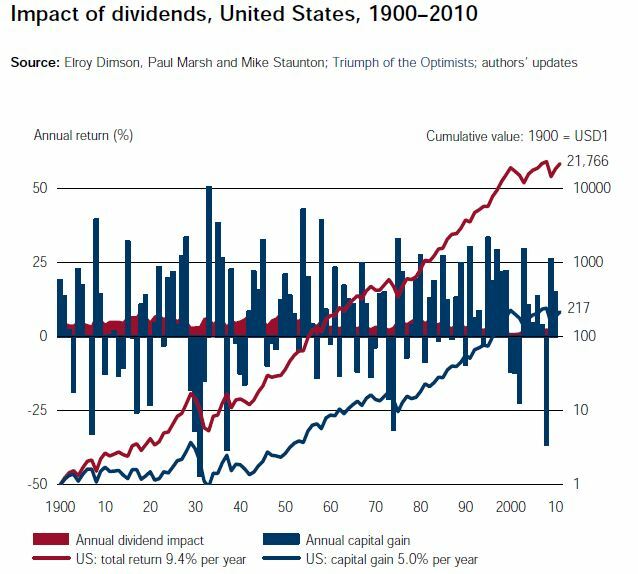 If we take the full time frame of 1871 to 2009, the difference with or without dividends is startling. 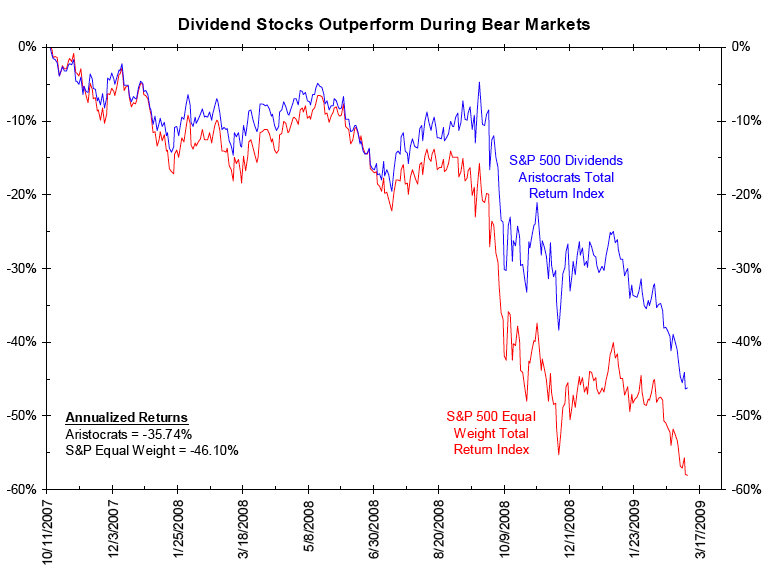 Not taking into consideration dividends re-invested grossly undervalues stock performance. In Credit Suisse Global Investment Returns Yearbook 2011, it again illustrates almost > 40% of total returns are directly impacted by dividends. The outperformance becomes more steep as time passes. 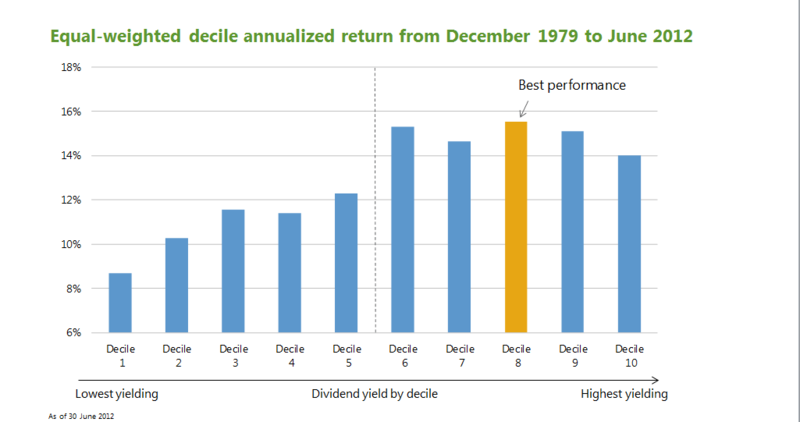 In Allianz Globals reports that compares dividend policy from 1972 to 2009, it illustrates the problem investing in non dividend paying stocks and the outperformance of the stocks that pays dividends and grow their dividends. 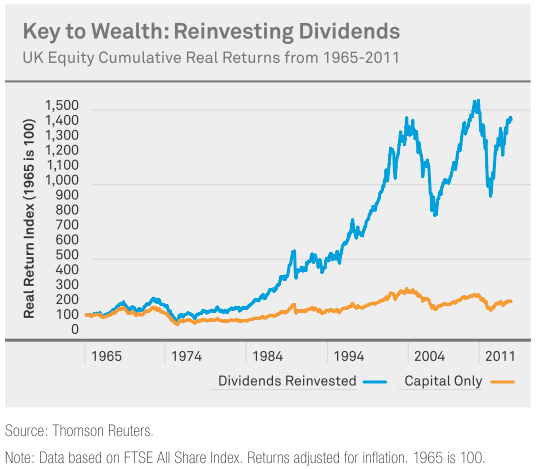 In the Credit Suisse Global Investment Returns Yearbook 2011, the above chart illustrates that since the 1970s, high dividend stocks have been doing very well. 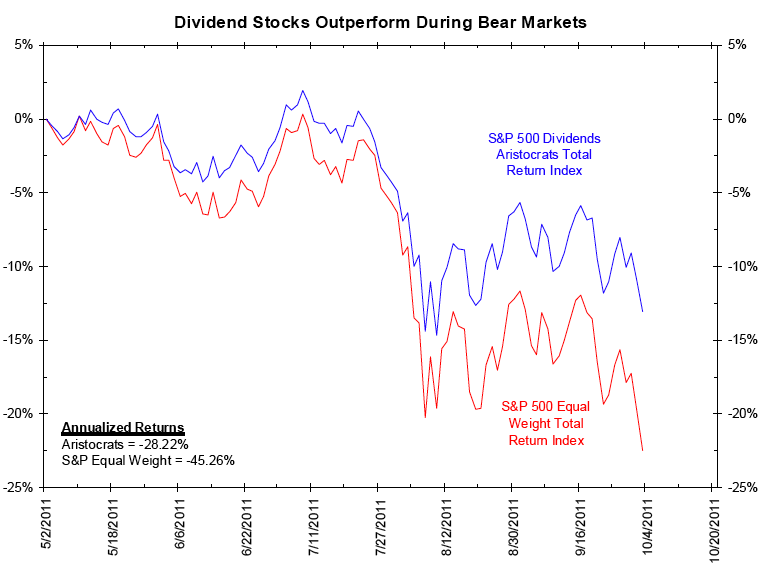 However the most consistent outperformers have been the medium dividend stocks. Whatever it is, the consistent underperformers have been the stocks that do not pay any dividends. 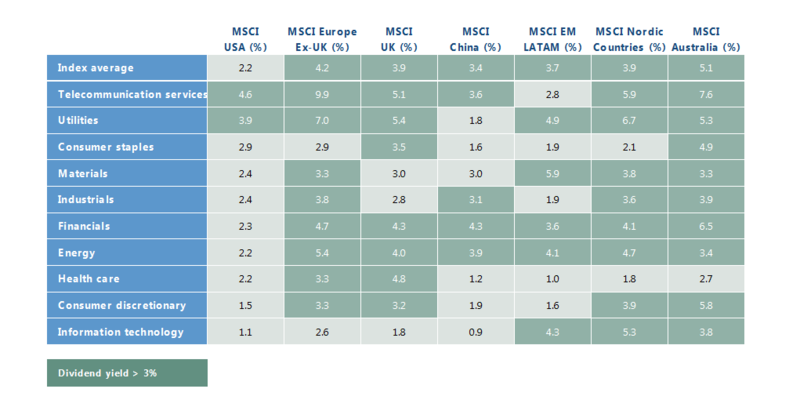 In the Credit Suisse Global Investment Returns Yearbook 2011, it shows that the outperformance of high yielders is not constraint to only US stocks but also stocks around the world including Singapore. In all categories the higher yielding stocks all look much better compare to no dividends but it is worth nothing that the Total Country strategy is not too shabby as well. It’s important to understand that it’s not the very highest payers you want – many high-yielding stocks got there the hard way through share price declines. It’s really the 8th decile of payers that puts you in the sweet spot for total returns. 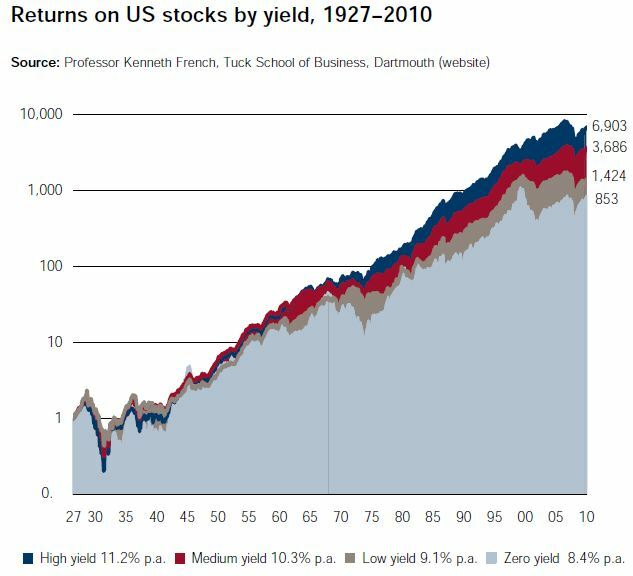 Nominal yields alone are not the story. 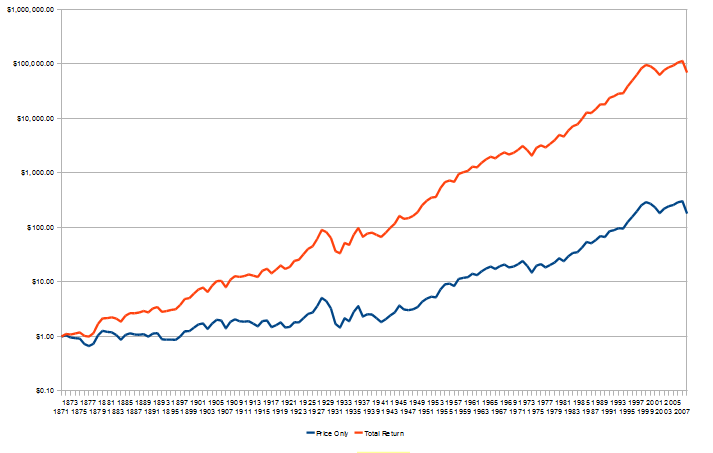 So what happens when you invest $1 in 1871, factoring with or without dividends? 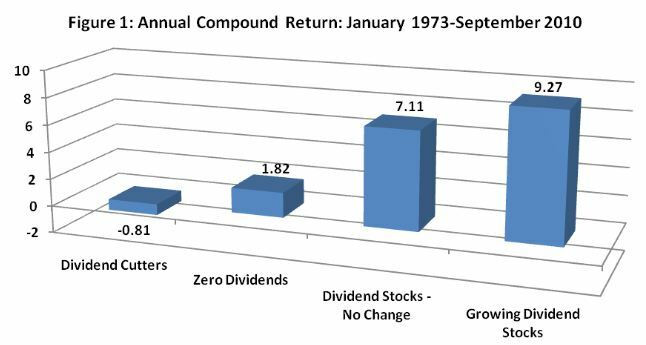 To further illustrate the dividend compounding effect, and a guide to a 5 step dividend portfolio action plan view the article compounding dividends. 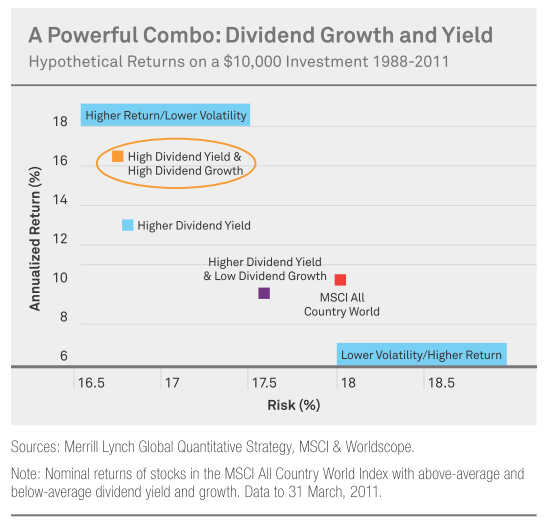 In BlackRock’s March 2012 Report on Dividend Investing in a New World of Lower Yields and Longer Lives, it again illustrates that re-investing the dividends back into the market greatly improves the compounding effect and the effect can get enormous with time. While reinvested dividends do make an important impact, stocks that pays dividends and grows at a good rate is also important. 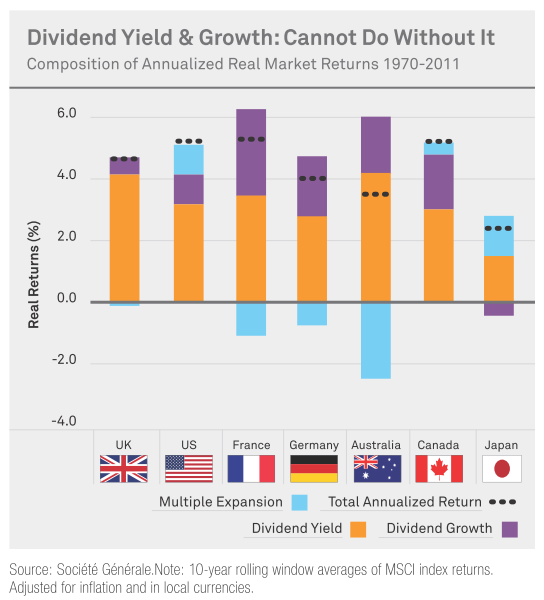 In BlackRock’s March 2012 Report on Dividend Investing in a New World of Lower Yields and Longer Lives, dividend growth is the largest contributor to nominal returns across key developed markets over the past 40 years. In the same report, it illustrates that while the best case is a high dividend yielding stock that have high growth rate, a high dividend stock that does not grow as fast tends to underperforms the broad market index as well. 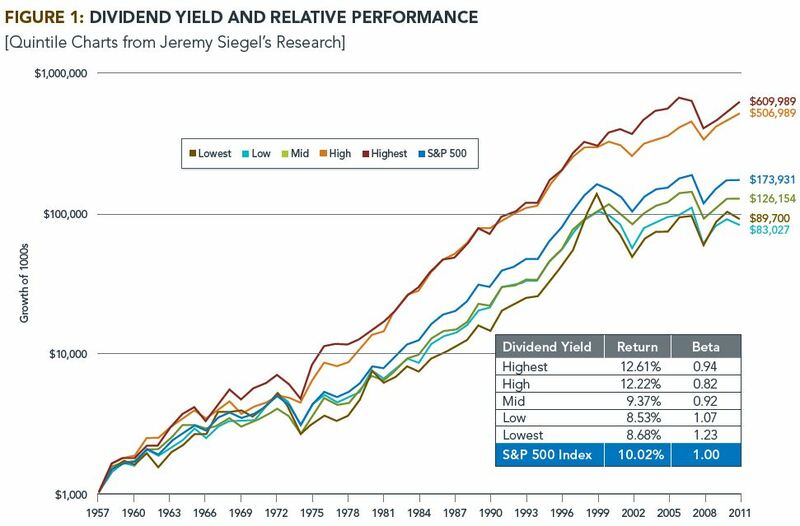 In BlackRock’s March 2012 Report on Dividend Investing in a New World of Lower Yields and Longer Lives,it illustrates the current low growth environment and how historically, high dividend equity tends to outperform other asset classes. 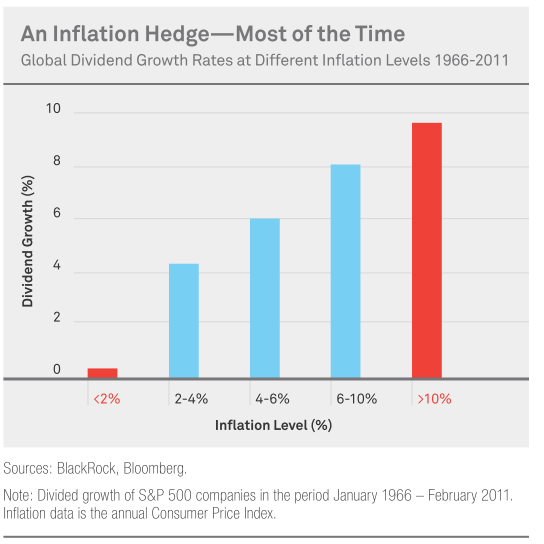 During periods of negative growth, high dividend stocks take a smaller hit. 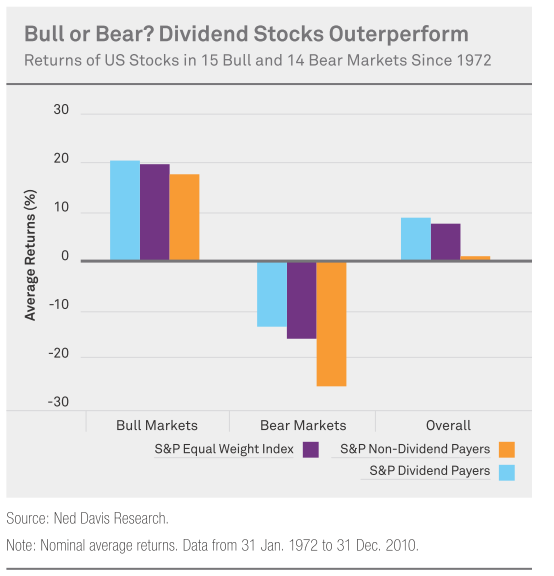 In the same report, it illustrates that for US markets no matter bull or bear, dividend paying stocks outperforms non dividend paying stocks. 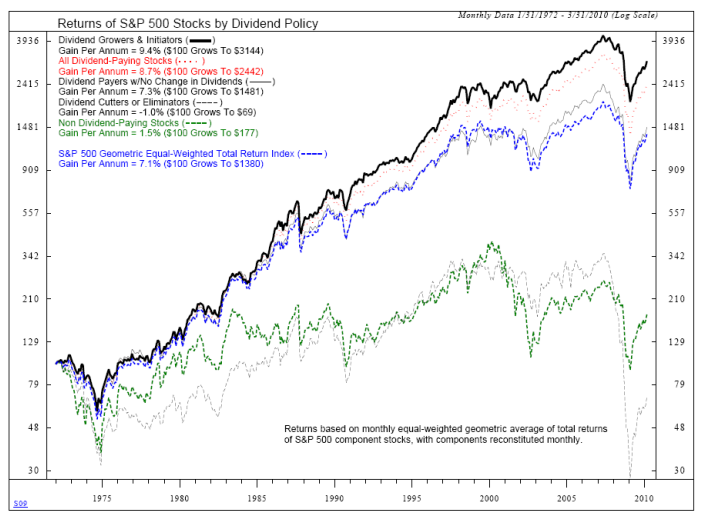 In a February 2012 Equity Compass report, it illustrates the outperformance of US Dividend Aristocrats, which are stocks that raise dividends for 25 years straight. 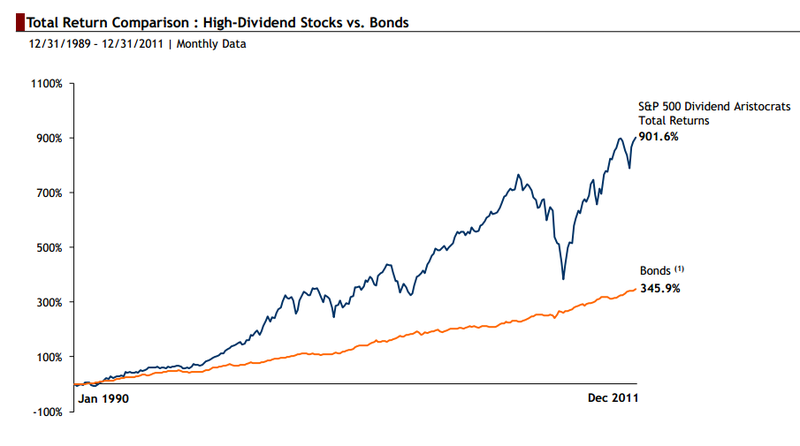 In James Bianco’s 2012 post, the relationship between stocks that consistently pay increasing dividends (aristocrats) and equal weighted stocks is what was illustrated previously. 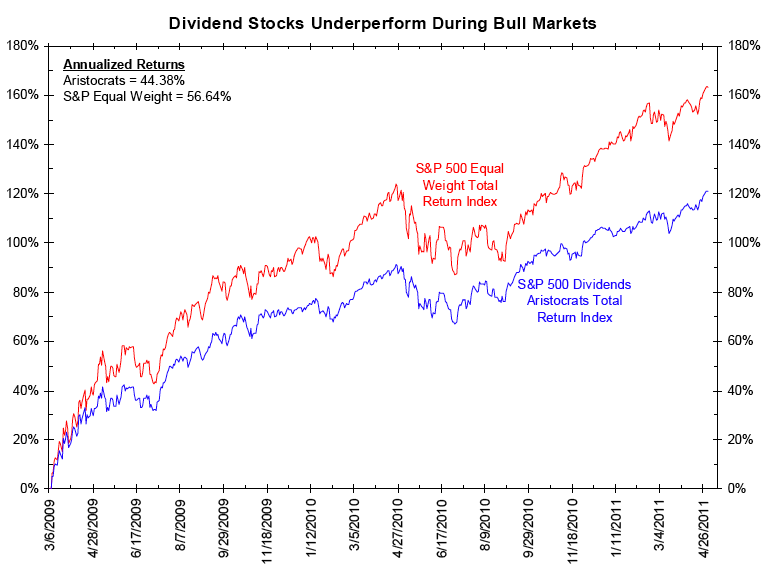 In bull markets dividend aristocrats underpreform and during bear markets dividend aristocrats outperform. 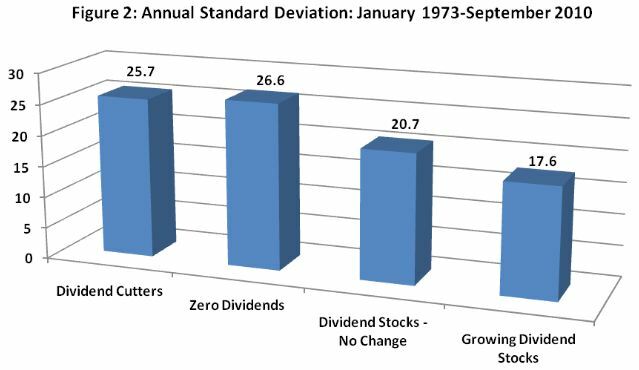 In the same study of 4 differing stock categories it is found that stocks that pays dividends or grow their dividend payout, on average have a lower standard deviation.This indicates lower volatility which affects investors propensity to do rash things. Inflation is a silent killer for savings, for those that are uninformed about it. Bonds in the 1970s are known as “certificates of confiscation”. Current scenario mirrors that of the 1970s where the rates are at ultra low and the only way to go is up. 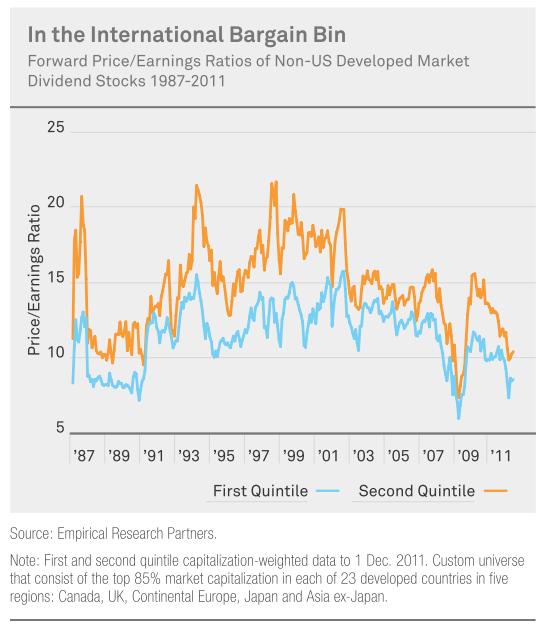 In BlackRock’s March 2012 Report on Dividend Investing in a New World of Lower Yields and Longer Lives, the non US dividend stocks have shown to be not in favor. 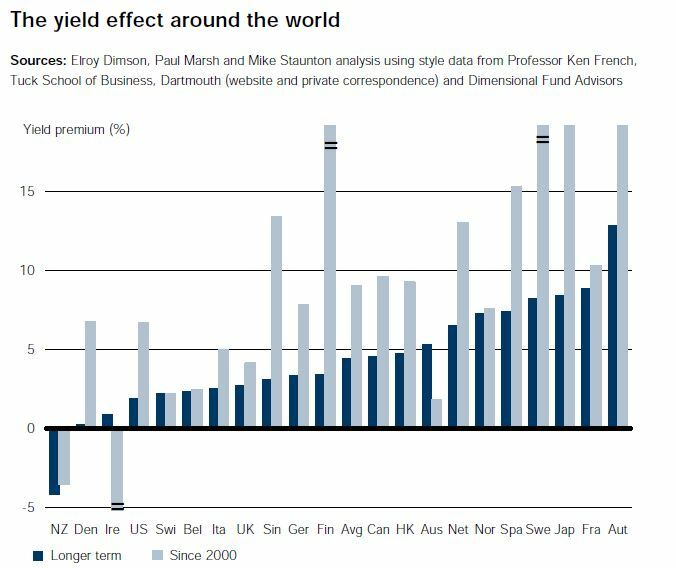 In this aspect it shows that for international investors they are not lapping up to dividend stocks in this lost decade (2001-2010). 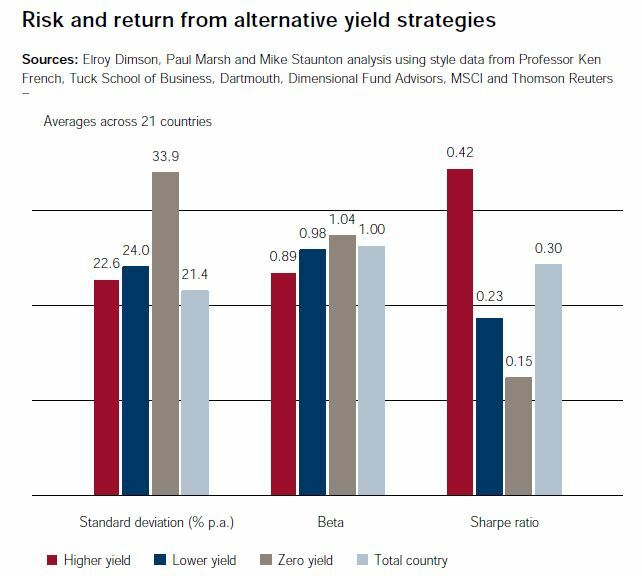 In BlackRock’s March 2012 Report on Dividend Investing in a New World of Lower Yields and Longer Lives,US dividend stocks looks to have unusually low payout ratio. 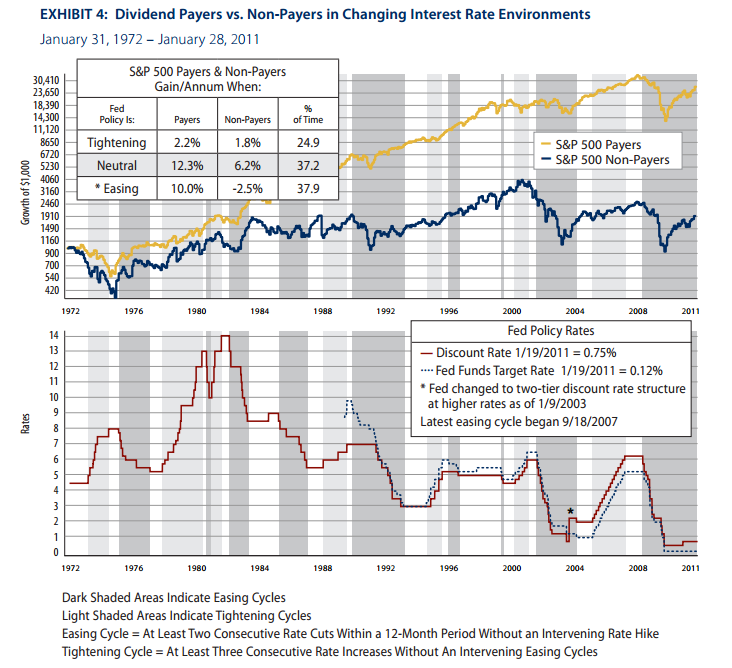 This may indicate that a reversion to higher dividend payouts. 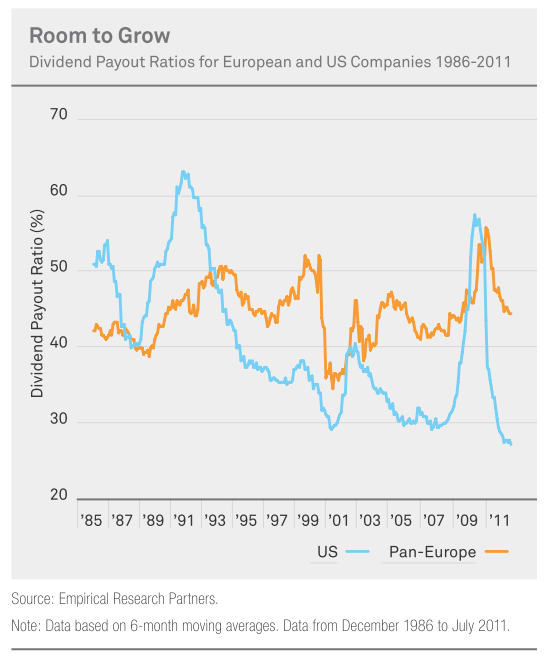 For international stocks, payout are low but are not excessively low. One thing to note is that payout increase seem to coincide with financial crisis where to pay out the same amount, the companies would have to pay out more cash from earnings, thus the escalation of payout. The yield, dividend growth and payout ratio are crucial components of total return. Further reading here, here and here. To get started with dividend investing, start by bookmarking my Dividend Stock Tracker which shows the prevailing yields of blue chip dividend stocks, utilities, REITs updated nightly. Make use of the free Stock Portfolio Tracker to track your dividend stock by transactions to show your total returns. 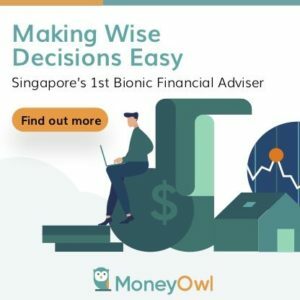 For my best articles on investing, growing money check out the resources section. after all these years, about 31% is from dividends income. (No re-ivestment of dividends). So tell me, “Is my “ROI” correlated with your historical data? 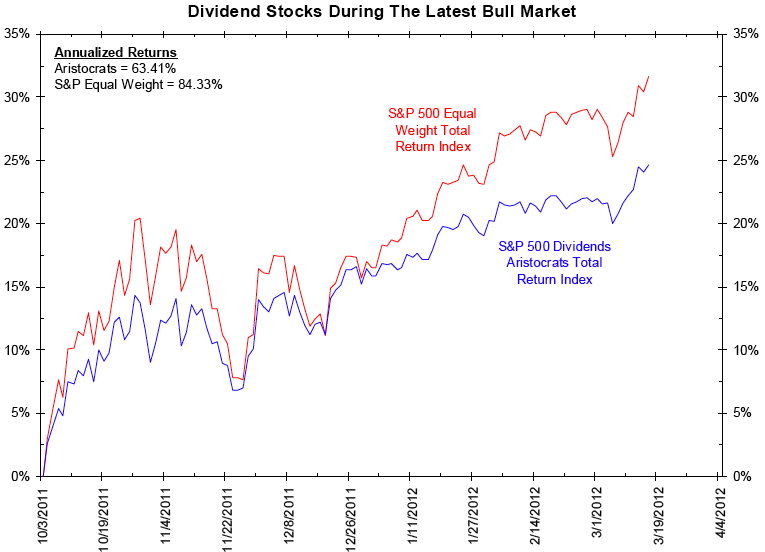 Dividend investing is definately a great way to go if you are looking to build long term wealth. I like looking for companies that annually increase thier dividends at a rate faster than inflation. Great info here about the effects of dividends on long term returns compared to companies that pay no dividends! Thanks for visiting. I am also looking for some of those. Unfortunately stocks in Singapore don’t always grow like some of these international companies. What have been your best growing dividend play?